Our Pimlico collection of bathroom taps evokes a traditional feel that pays homage to yesteryear. The classic styling of Pimlico's cross-head handles with their white indices and the gentle, gracefully curving spouts makes this selection of basin taps and bath taps a must for your traditional bathroom. 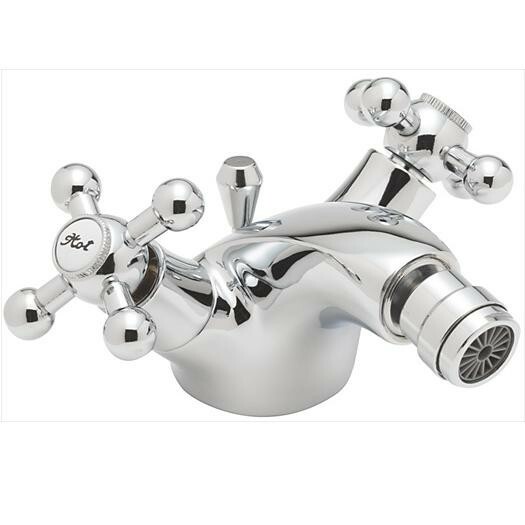 The total height of this tap is 75mm and the projection from centre of the body to centre of the spout is 90mm. This bidet mixer tap is supplied complete with a pop up basin waste. It is suitable for both high and low pressure water systems and requires a minimum pressure of 0.2 bar. To add the finishing touches to your room, we recommend our Knightsbridge range of showers shown in the showers section.